It’s the fundamental question facing anyone who has ever embarked on a home renovation: How likely am I to get the money back when I sell my house? There’s no easy answer, because what a buyer might be willing to pay depends on many factors — everything from the choice of project to the materials you use to the value of other homes in your neighborhood. But it’s important to have some idea of what your improvements might be worth. If you want to invest more than you can hope to recoup because you love your house and plan to live in it for a long while, that’s fine. But consider the following guidelines and you’ll avoid unpleasant surprises when it comes time to put up that For Sale sign on the lawn. Not all remodeling projects are created equal. “People buying a house look first at kitchens and baths,” says Kermit Baker, director of the remodeling futures program at the Joint Center for Housing Studies at Harvard University. 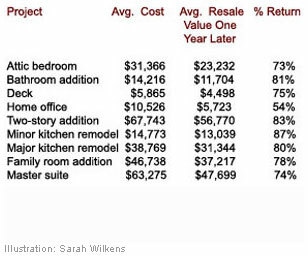 So while these rooms can be the most costly to redo, they’re more likely to pay for themselves. Adding rooms, such as a family room or master suite, also tends to fare well at resale time: Bigger homes command higher prices. And just because a project is expensive doesn’t mean it will pay back more. Often, minor improvements can yield major dividends. According to Remodeling magazine’s annual analysis of cost versus value, a kitchen “face-lift” — painting, refinishing surfaces, and upgrading appliances — will return more than a full redesign. The key to spending less is spending it wisely. “If you take $20,000 and spend it judiciously on a kitchen, you can make it look a million times better,” says Remodeling senior editor Jim Cory, who supervises the survey. “The design and product selection are key.